RightCondition: Will Scott Brown stop ObamaCare? An important question to consider seeing that his entire campaign has now been focused on this one issue. Although the legislative technicalities have already been discussed, I decided that a picture might convey the idea better. For all the out-of-state supporters clamoring for a Scott Brown victory, this is for you! By the way, Democrats striking a deal to exempt labor unions from the Cadillac tax means that the current version will be accepted by the House – in other words, Brown’s vote will be entirely and utterly useless. At this rate a vote for Joe Kennedy, the only candidate promising to repeal ObamaCare is the only sensible solution. According to the best pollster on the net this race has done the impossible, tightened to a point where a Republican could actually win this. Coakley (D) is at 49%, Brown (R) is at 47%, Kennedy (I) is at 3% and 2% are still undecided. This represents an 8% jump for Brown in what appears to be undecided voters breaking for the Republican. At this point a ripple is spreading through the internet and the country as a whole, expect in a few hours engines firing on all cylinders from the two major parties. Conservative websites will be all over themselves declaring this race a done deal while prepping for the next Reagan revolution and liberals will be contemplating how to take their own lives in the fastest and most efficient manner. Sadly another group will be watching idly by, lacking representation and acknowledgment. This group understands that a Brown victory accomplishes exactly nothing as they watch the two party system dismantle the “little guy” and continue the status quo. A historical precedent of two parties merging and becoming one does not bode well for America. Worse yet, Brown’s victory is predicated entirely on stopping ObamaCare and we have so many people believing this myth that they willingly parted with over one million dollars and handed it over to Brown. Good news is that Brown is very good at spending, he has a very impressive track record! “There is no point in implementing a national system when we already have the same thing in Massachusetts”. So listen very carefully folks. You are supporting a man who plans to use his time in Washington to convince every other state to implement RomneyCare. Why do you need ObamaCare when you have 50 RomneyCares? You follow? You think you are voting to stop universal health care, think again! Next time you blindly throw you support behind a liberal from Massachusetts, carefully consider as to what you are doing. Oh and about those JFK style tax cuts he proposed. After 11 years as a public servant, Brown did not author a SINGLE tax cut. Dwell on that folks. This humble blogger believes Scott Brown’s victory will prove to be an error. For those that claim Joe Kennedy does not matter, his support now exceeds the margin between Coakley and Brown so next time a squishy big spending Republican decides to run there will be another true fiscal conservative waiting. Are you positively giddy over the prospect of Scott Brown winning in the upcoming Massachusetts special election? Are you currently supporting Scott Brown through time, money or both? Do you believe that limited government policy over the past thirty years failed, leading us to ever growing government? Are you partial to the Tea Party movement? If you have answered yes to all these questions then allow me to prove to you that your support for Scott Brown is a contradiction to everything you believe in and will hurt this country more than any rubber stamp liberal. Living in Massachusetts the excitement over a Republican taking the mysterious Kennedy seat has generated what appears to be a political frenzy last witnessed only during the Obama campaign. Many advocates of small government and individualism have thrown their support to Brown including prominent talk show hosts like Michael Graham and Jay Severin, multiple prominent conservative websites like HotAir, RedState and PatriotRoom who not only endorsed Brown but are pleading with people to send donations. Local tea party activists are phone banking and blasting mass messages to anyone willing to listen. Organizations like the Tea Party Express (a GOP front group) and OneNation PAC (limited government) have also formally endorsed the candidate. Facebook, twitter and social media sites are on fire with Brown fever. A major drive behind Brown is psychological, the idea of “sticking it” to the Democrats in a deep blue liberal bastion like Massachusetts is so enticing that it is beginning to cloud judgment. However supporting an individual due to him being a Republican is as frustrating as Massachusetts citizens voting for anyone with a (D) next to their name. Another major drive is to stop ObamaCare with Brown depriving the crucial 60th vote, a reason so laughable as to hardly merit an explanation. Truth is, if the Democrats want to pass ObamaCare then they will do so whether Brown wins or not. Not only can Reid convince Snowe or Collins, but Pelosi can accept the current Senate version of the bill allowing ObamaCare to sail into Obama’s office before Brown’s jet lands in Washington DC. As the last remaining reason, regrettably persistent ignorance despite the mounting fiscal problems and cries of “throw the bums out”. Most supporters outside this state have no clue about Brown’s legislative record and it is imperative they discover the truth before it’s too late. Of course there will always be a segment of the population falling for the song and dance, but the support being generated is coming from sources that claim to be experts on all things political! A professional politician skilled in beautifully weaving songs of fiscal responsibility and bucking the trend, a trend not too difficult to buck in a state where government is the panacea, terrorists get asylum, Columbus is evil and the American flag is a source of embarrassment. A state Senator serving during Romney’s administration supporting and voting for billions in additional spending, millions of dollars in fee hikes and the utterly broken MassCare system known as RomneyCare. A man who voted for a property tax hike in his town of Wrentham, purposely overriding proposition 2 ½ designed to keep property taxes limited. A man who went on air to publicly speak out against ending the state income tax on the 2008 ballot and returning 12 billion dollars back into the pockets of Massachusetts citizens. Claiming that depriving 12 billion from the State coffers is reckless, despite knowing full well that the state spent almost 49 billion in 2008! A man who proudly speaks of his involvement in RomneyCare, a plan widely endorsed by both Ted Kennedy and Hillary Clinton champions of universal single payer health systems. Yet virtually everyone from CATO to WSJ confirmed RomneyCare’s dismal failure. 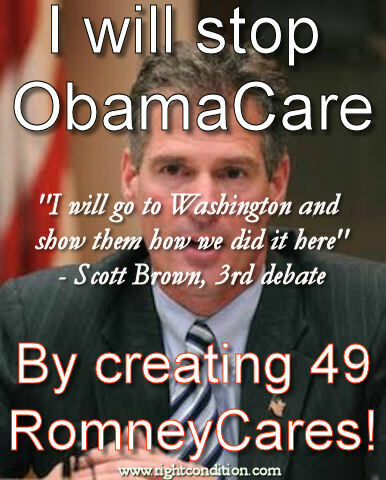 In fact, Scott Brown in a debate just yesterday announced that he will go to Washington and bring RomneyCare with him. RomneyCare forces individual mandates upon citizens of Massachusetts resulting in steep penalties for those refusing to pay. RomneyCare has skyrocketed insurance premium costs doubling the national average while extending wait time for doctors by weeks and sometimes months! To make such an assertion in a country where no one is denied treatment is truly disturbing. A right to health insurance is as much of an abomination as an individual mandate, a direct and immediate move to collectivism. Patriots and activists are you listening? Who is Scott Brown? A big government Republican and a sellout posing as a conservative while riding on a wave of populism spurred on by the Tea Party movement. After reading the above facts, there will be many reluctant to pass up on a chance to send a Republican to DC over someone like Martha Coakley. Weighed down by the shackles of the two party system and the gravitas in voting for the lesser of two evils, facts turn into distractions. I shall remind you here that you are still voting for an evil and evil in any form will hurt you. – Bush Jr/Congress establishing the Department of Homeland security and 9 other agencies. – Bush Jr/Congress strengthening the Department of Education through No Child Left Behind. – Bush Jr/Congress passing the first stimulus package and a 700 billion TARP program. Rank and file Republicans like Scott Brown and his recent endorser John McCain have made all of this possible. A quiet and methodical expansion of government took place while Americans stood by under the grossly false assumption that a fiscally responsible party was in power. Yet consider the public outrage currently under Obama and liberal Congress, even though Obama is simply an extension of the same things done by Republicans. So as Republicans participated in ever expanding government under the guise of fiscal responsibility America slept. Why would you willingly send someone to DC who will repeat the mistakes of previous decades? It would instead appear that Martha Coakley is precisely what is needed to keep the fire burning and motivate people to get involved. Scott Brown and other Big Government Republicans coming in 2010 stand to significantly derail the Tea Party movement. Wolf or wolf in sheep’s clothing? You have probably heard the expression, but let’s examine it further. Imagine you are walking down a road and you see a wolf ahead of you. You will fear it, but you have time to react and defend yourself. In fact even if the wolf lunges you have time to defend yourself. Now consider a wolf ahead of you that looks like a sheep – you just keep on walking. Your guard is down and you are relaxed and if the wolf suddenly attacks from behind your survival rate is significantly reduced, you have been caught unaware! This gruesome analogy is truer now in today’s politics than ever before. Republicans pretending to be sheep prove to be far more damaging because an unsuspecting populace is often caught unaware. Often this damage is difficult to recognize, much more difficult than today’s situation when the wolves control the House, Senate and White House. Patriots are on guard and passionately defending themselves, but consider the amount of damage caused by 8 years of GOP control. Virtually no job growth, businesses hurting, dollar is devalued, insurance premiums through the roof, industry shrinking – life in America has declined and the heavy hand of government is behind all of it. A heavy hand delivered by wolves in sheep’s clothing. Why would you willingly send another wolf in sheep’s clothing to Washington? What can be done? A Free market approach! Allow me to present an analogy based on a system that you believe in and love. Imagine if you will a product on the market. This product has been around for a long time, it used to be great and it was mass produced because people were buying. Over the past several years it has become obvious that the quality of this product rapidly deteriorated, but consumers continued to purchase and manufacturers continued to produce without any changes. If the demand persists then so will the supply! Now imagine if people fed up with the quality of this product began to turn away alerting their friends and family of rapidly declining quality. Still, manufacturing is difficult to change and so misleading advertising was implemented in order to maintain demand. Still, consumers did not believe the message and demand continued to fall. At this point, the manufacturer in order to stay in business would have to either improve the quality or suffer from competition. If the demand drops off so will the supply. The beginning part of the analogy is the story of the GOP and the last part of the story is what needs to be done. As long as the people continue to buy what the GOP machine produces the supply of low quality big government candidates will continue to flourish. Every time you cast a vote, donate money or volunteer for a Republican whose mission is to maintain or grow a government that has gotten too large and too intrusive you are sending the wrong message to the market place. This message not only continues to feed the GOP machine, but discourages competition from emerging! Supporters of Scott Brown, John McCain, Olympia Snowe, Susan Collins and other big government politicians continue to enable the very machine they so despise while stifling innovation and competition that could truly bring out politicians capable of implementing change. When it comes to government power and size there is no moderation and this fallacy has infected not only the population, but a major portion of the GOP. There is no such thing as being a little bit pregnant. We the people are capable of ushering in any change we see fit. Despite big business, big media, big labor and every other cog of the machine will try to stop you from preventing the growth of government. Government only moves one way and supporting it becomes more and more difficult. Examine spending and public employee growth in the past 30 years if not convinced. We must seek out only those candidates whose message aligns with reversing the damage being done by government. Do not under any circumstance support a Republican in the name of voting for the “lesser of two evils” particularly when in some cases the “lesser” evil is just as great if not worse. Send a message that you are not interested in the product being offered. If there are no candidates to support in a particular election then stay home, not voting is just as powerful as voting. Educate and inform others of the mistakes in supporting the lesser of the two evils. There is a candidate running as an independent, by the name of Joe Kennedy who much more closely resembles the ideals of small government and individual freedom. A vote for Joe Kennedy is a vote against big government and sends a powerful signal that will further inspire small government candidates to run in the future. This entry was posted in Independents, Libertarian Party and tagged Joe Kennedy, Massachusetts, obamacare, romneycare, scott brown, special election, U SSenate on January 15, 2010 by Jake_Witmer. There is no part of the existing federal Nanny State that wouldn’t be less onerous if it were broken into 50 separate nanny statelets. Freedom is Right, but freedom doesn’t work merely because it’s Right. Freedom works because of the competition created by decentralism and the right of exit. You can have improved competition without having perfect freedom, and the fruits of that competition become the argument for even more freedom. Arnold Kling has a recent post up at http://econlog.econlib.org/archives/2009/08/what_is_real_fr.html arguing that real freedom depends on having the choice of exit, rather than having a democratic voice. Libertarians should always push for decentralization of government authority, even if we think that other people (e.g. “dixiecrats”) are using this means for a different end. If we really believe that freedom works, then we shouldn’t fear competition between jurisdictions that can vary how much freedom they allow. If our liberties in our local jurisdiction can only be protected by the standards of a distant central government, then our cause is already lost. A distant central government will always be captured by rent-seeking, thanks to the diffusion of its monitoring and the concentration of its benefits. Economists have a name for the result of having the choice of exit: http://en.wikipedia.org/wiki/Tiebout_sorting. Another name for it is “voting with your feet”. THE WHITE HO– USE,January 11, 2010. According to the sources below: By executive order, President Obama has set up a Council of Governors, a step toward martial law, involving military activity in the United States. Contact your state legislators urging them to protect us from federal tyranny. I ask that you protect the people of this state from federal tyranny. We urge nullification of unconstitutional federal laws. The states can pass legislation that nullifies or voids a federal act within the boundaries of that state. There is currently legislation in many states on nullification of federal laws dealing with firearms, drugs, and federal ID. This year, states are expected to introduce nullification legislation dealing with everything from healthcare to federalizing the Guard. intersting topic. Being a conservative myself, I support Brown. That is how bad of shape MA is in right now. No, he’s not the dream candidate many conservatives want, but you know what? if it means a shake up in the beyond liberal thinking in MA, I will take it! and btw this is more than just a a vote FOR Brown, it is a vote AGAINST Obama’s national policies~!